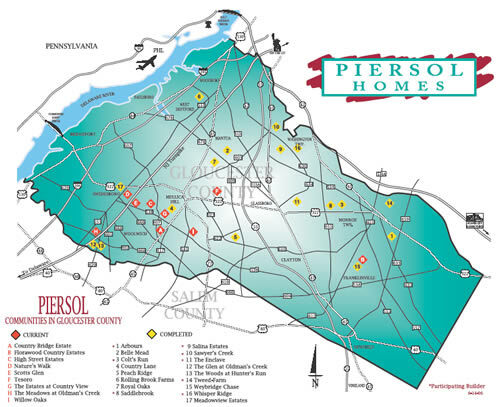 Piersol Homes is currently offering outstanding opportunities for living in luxurious communities in the most desirable locations in Gloucester County. Whichever community you select you’ll find the same dramatic designs and lifestyle opportunities over 1,000 Piersol homeowners are enjoying in nearly 30 communities throughout Southern New Jersey. *For a comprehensive list of features included at individual Piersol Homes’ communities, please visit the specific community pages on this website. Click for an enlarged, printable view (PDF).